I saw this on Iowa Girl Eats, and I knew I had to try it. 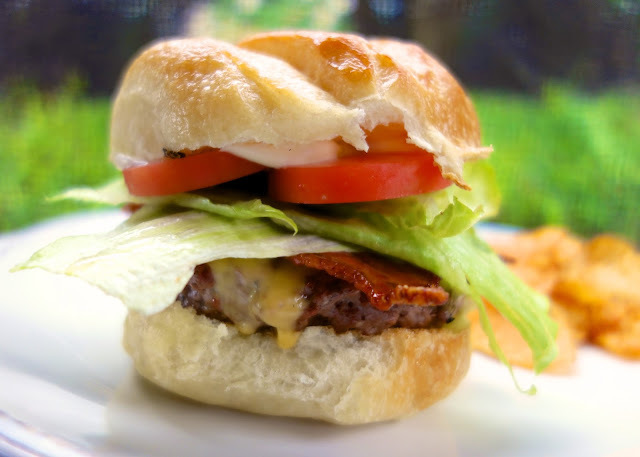 Kristin adapted her burger from the Iowa Beef Industry Council. I looked at both recipes and decided to put my own twist on the burgers. We both LOVED this burger! Absolutely LOVED it!! The burgers were so juicy and the bacon was heaven sent. I baked the bacon in the oven and brushed it with pure maple syrup. I will be making the bacon again for breakfast, or just for snacking. In my opinion, it is good anytime of the day. The burgers only have a few ingredients. I am sure you have them on hand right now. I am making a batch of these burgers when I make the Beer-B-Q Chicken for Labor Day. It is a great way to finish off the beer (if you don't want to drink it). Give these a try ASAP! Combine hamburger, worcestershire sauce, beer and pepper. Form into 3 hamburger patties. Preheat oven to 400. Place a baking rack on a foil lined pan. Place bacon on rack and bake 15-20 minutes. Carefully remove pan from oven. Brush bacon with maple syrup. Bake additional 5 -7 minutes, until bacon is crispy. Set aside. Grill burgers approximately 5 minutes on one side, flip and cook an additional 3 minutes. Top each burger with cheese and melt. 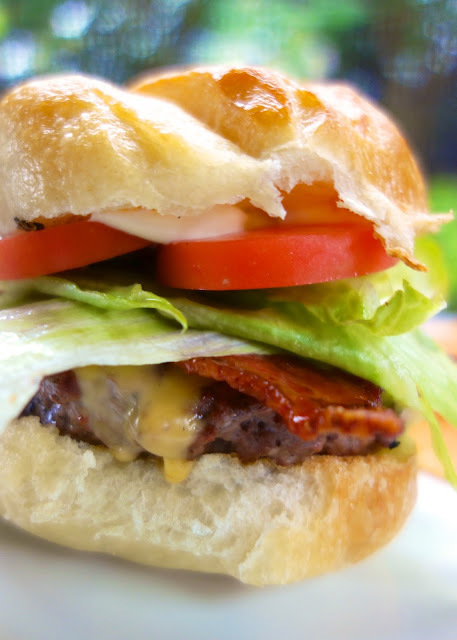 Place burgers on bun and top each burger with 2 slices of bacon. Top with additional burger toppings if desired. How much sweetness comes through in the burger? It sure looks great! Joan - the burgers were not sweet at all. 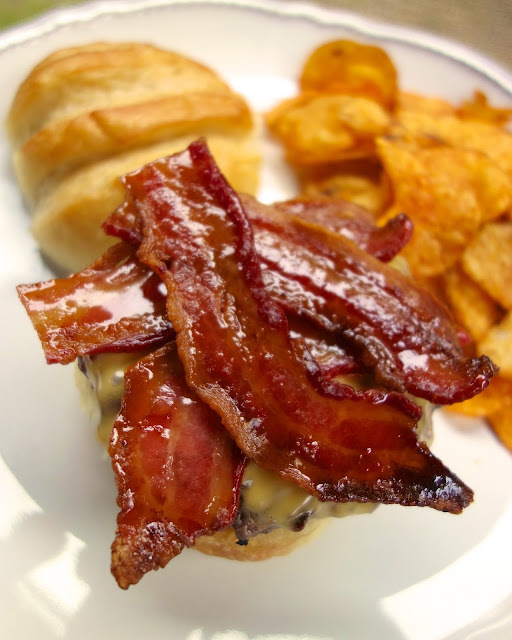 There is a hint of maple on the bacon, but it isn't a sweet burger. Hi Stephanie I love your blog my kids do too :-) do you remember what brand buns you used they look great. I used French Bread Rolls from Publix.